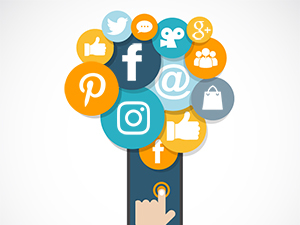 Most people know that social media can help your business connect with customers, improve your search engine results, and expand awareness of your brand. But you may not be aware that social media is evolving rapidly, with new features being rolled out at a mind-blowing pace—features that blur the line between social media and ecommerce. A successful social media strategy requires more than just simple posting. With 87% of customers saying that social media helps them decide what to buy [from MarketingProfs’ Social Media as the New E-Commerce Platform Infographic], any business selling products or services can’t afford not to take social media, and social commerce, seriously. Over the past couple of years, social media has become more than a place where people find guidance and inspiration for what to buy, but a place where they actually launch their shopping. 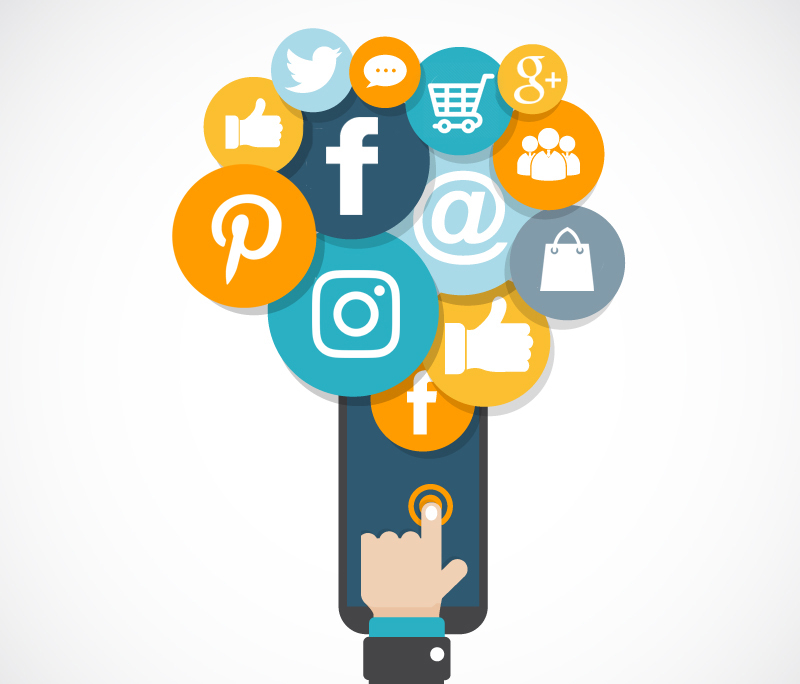 The best way to realize a return on investment in social media and see a positive impact on your practice is to take advantage of the latest interactive and commerce-friendly features that are available today. The foundation of your success is an ecommerce site that is the engine making all of these features work, to which you are directing your social audience. Wikipedia offers a definition of social commerce as the use of social networks in the context of e-commerce transactions. While some define it much more narrowly as the ability to purchase from a company within the native social media experience, most consider social commerce in the broader sense, referring to the general concept of online media that supports social interaction and engagement with a brand, incentivizes customers to interact on a website and talk about a brand, and offers customers tools to research, compare, obtain social proof, and ultimately purchase online. Social Media has become a gateway to ecommerce. As social media has evolved, the way marketers are using social media is changing right along with it. With the top social media platforms each offering their own version of “buy it” buttons, shoppable posts, product tagging and pricing, and more, “the days of brands using social platforms for only top-of-the-funnel hype are long gone,” says business intelligence and research firm, Gartner L2. “Every new feature brings another layer of commerce capability to the grid,” driving the transition of social platforms into powerful tools that facilitate transactions with a swipe, click or tap. How does social media shopping work? With the bulk of the social media market share—representing over 2 billion monthly active users—Facebook dominates as a source of social traffic and sales. The social media behemoth constantly reinvents its commerce-related features, upping the ante with new and improved features seemingly every other week. Facebook offers on-page shops, product tagging in posts, and enhanced advertising features that help you target shoppers with precision. You can build a Facebook shop that more-or-less mirrors your online store, with categorized products and services that have add to cart buttons that take the user directly to your online store for purchasing. 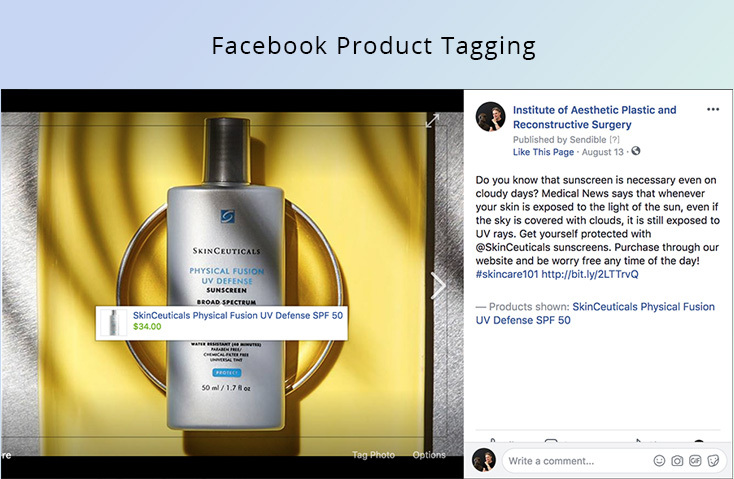 Product tagging offers even more flexible and creative ways to drive organic product discovery, allowing products to be tagged in any of your posts. When you tag products in your posts, the post will display “Products Shown” or “Featured Products” depending on whether you’re on a desktop or using the Facebook mobile app. A simple tap on the product shows product information and pricing, and takes the user to the product or service on your online store. With the highest conversion rate for all social media ecommerce traffic, it’s no wonder brands large and small are using Facebook to organically connect their social audiences with ecommerce. Instagram is the fastest growing social media platform today, representing a huge opportunity for you to drive your audience to your online store’s products and services. Until recently, only certain brands and those willing to shell out budget for advertising had the ability to directly link to their website or online store from Instagram posts. However, the roll out of Instagram shopping, shoppable posts, and Instagram Stories has quickly moved Instagram into the top position as the hottest social platform for commerce. Warning: You can’t just insert a link in your standard Instagram post caption. Such links are not clickable and will go nowhere. However, with an integrated product catalog through a Facebook Business Manager account, product tagging and shopping in Instagram become easy. The shoppable Kybella Consultation post shown here was achieved with a linked product catalog in Facebook, which is generated from the practice’s online store from DermPRO. The shopping bag icon indicates that there’s something purchasable, and a simple tap on the image displays the price. 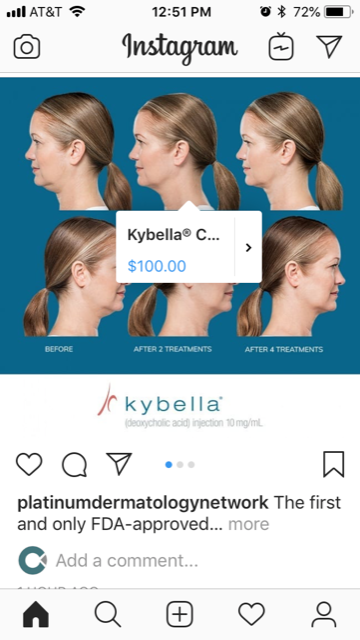 Another tap takes the user to the Kybella Consultation on the Instagram shop where additional images and information are available, and one more tap leads to the purchase page on the practice’s DermPRO store. Interesting Fact: Instagram leads in Average Order Value for social commerce at $65, followed by Pinterest at $60 and Facebook at $55. Pinterest has always been an important social platform for ecommerce. The user base is smaller than Facebook’s but Pinterest serves more as a discovery and save tool than a social interaction tool, which makes it ideal for targeting buyers. In fact, 93% of active pinners say that they use Pinterest to plan for purchases. Pinterest is a powerful vehicle for driving traffic to your online store and, more importantly, converting that traffic to sales. According to a study by social marketing company Piqora, each pin generates $0.78 in sales on average. Further, pins with a price—Rich Pins—have a 36% higher chance of being liked. The key to social commerce in Pinterest is Rich Pins. Rich Pins show certain metadata right on the Pin itself, giving pinners a richer experience and increasing engagement. 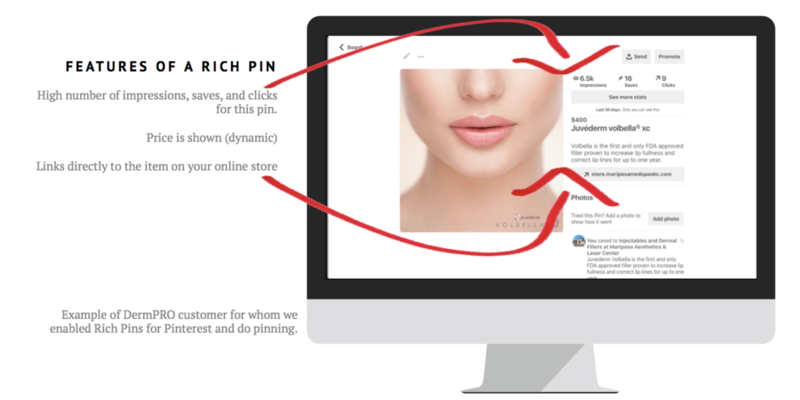 Rich Pins are dynamic and interactive, and in the case of the product pins you can do from your online store, they automatically update prices as they change in your store. Pinterest guidelines indicate that Rich Pins as well as properly formatted images will help your pins rank higher in Pinterest and be seen by a larger audience. The Volbella Rich Pin shown in the above image has over 6,500 impressions. If you’re going to do it, do it right! Plan ahead with a posting calendar. Posts should incorporate diverse topics of interest to your intended audience. Your social posts should focus on your audience and their needs. Do your hashtag homework. Define—and stick to—a hashtag strategy that will help you extend your reach and grow your fan base. Careful… Hashtag protocol is different for each social platform. Take the time to make high quality graphics. The importance of quality images can not be overstated. Quality images are not only going to attract more followers, but in the case of Pinterest, will increase the rank and impressions of your pins. Now more than ever, social posts are highly visual and require attractive graphics that will stand out from the crowd. Each social platform has its own guidelines for image sizing and design. DermPRO applies our professional graphics designs to ensure that your social posts are formatted properly for optimal viewing on each social media platform. Include interactive features and content that enable purchasing from a simple tap or click. By linking Instagram posts and stories, Facebook posts, and Pinterest Rich Pins to commerce-enabled pages where purchases can be made, you will establish direct connections between your social content and commerce. Need help pulling it all together and enabling these powerful commerce-related social media features? Fill out the form in the sidebar of this page to learn more about how DermPRO can help. Social media is increasingly essential to marketing success for any company today. Yet many aesthetics practices find themselves without the needed in-house resources for social media success, and are missing out on this important tool for growing their business. Marrying our aesthetics-industry-leading ecommerce services with the commerce-friendly features of social media, DermPRO is helping dermatologists and plastic surgeons extend their reach to audiences who might never have found them otherwise, and helping convert those audiences with interactive social content that makes purchasing easy. Learn more about Social Media Posting services from DermPRO by submitting the simple form in the sidebar of this page. 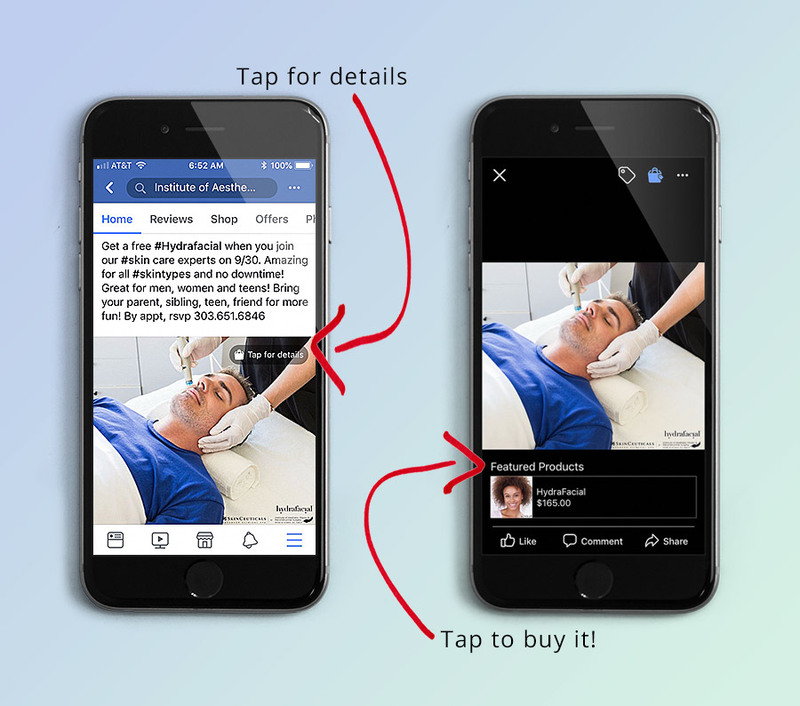 Marrying ecommerce with the commerce-friendly features of social media, DermPRO is helping dermatologists and plastic surgeons extend their social media reach, and helping convert those audiences with interactive social content that makes purchasing easy.